The eagerly awaited Hornbill Festival, is one of the most cherished festivals of Nagaland, India’s Far North Eastern state. Locals celebrate the fiesta with much enthusiasm and zeal. The festival is named after Hornbill, one of the most venerated bird species in the state. Interestingly, the importance of the bird is reflected in a number of tribal cultural expressions, songs and dances. Almost 85% of the state's population still depends upon agriculture. So most of their festivals revolve around agriculture which they consider sacred. The Hornbill Festival is one of the largest celebrations of the indigenous warrior tribes of Nagaland. 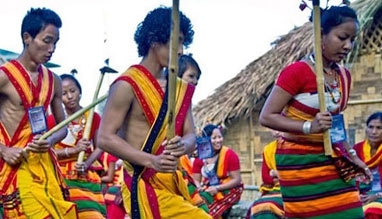 Naga people have a rich tradition of maintaining their unique heritage and customs. For this reason, people plan Nagaland Hornbill Festival tours. In spite of the tremendous modernity entering into their lives, the people have preserved their customs and legacy. Doing so, they have kept the torch of their tribal identity lighted. The state is called the 'Land of festivals' and people dwelling here have a fondness of celebrating the deeds of their ancient warriors and folk heroes. Moreover, the medleys that immortalize love stories, folk tunes and gospel songs are also cherished. Each of the tribes and subtribes in the state have their own way of cultivating their individual culture. 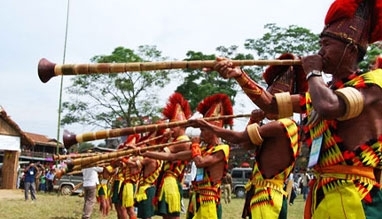 In addition to their traditional ceremonial attires which is different for each tribe, there are multi-colored spears, doas with dyed goat's hair. Add to that the exotic headgears and ivory armlets which steal the show. In earlier times, the fighters had to prove their bravery, in order to wear these. The Hornbill Festival is indeed the largest celebration in Nagaland. There is a huge gathering for merrymaking in the form of drinking, eating, singing and dancing. When is the Hornbill Festival Nagaland in 2019? 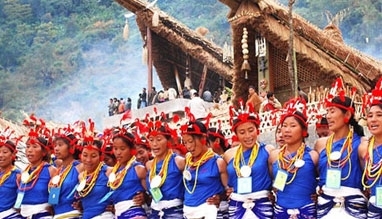 Hornbill Festival is celebrated annually during the first week of December, i.e. from 1st-10th. However, during the year 2013, it was extended for a few more days. It now normally concludes on December 10. The festival is held at the Naga Heritage Village in Kisama, located around 12 kilometers from the capital of the Nagaland, Kohima. It begins at 9 am every day. You can reach the venue by booking a taxi. Purchase the tickets at the entry gate and pass through the security check. However, make sure you have a valid pass to park the vehicle at the site. How is the Hornbill festival Nagaland celebrated? 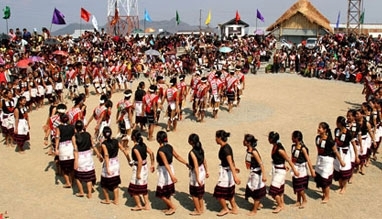 Hornbill festival, also known locally as the 'Festival of Festivals', is organized by State Tourism and Arts and Culture Department, Government of Nagaland. The fiesta is celebrated to encourage inter-tribal harmony and promote colorful local culture and traditions. The visual retreat further displays the unique customs, rituals and practices as well as preserve the heritage. Tourists are warmly welcomed and are treated well. The celebrations are attended by all the major tribes of Nagaland who present themselves with various arts, folk songs, dances and games. There are numerous displays of handicrafts, handloom, multi-cuisines, local food stalls. While a rich amount of rice beer is always at hand to indulge in. Evenings are lighted by the thrilling Hornbill National Rock Concert in which bands from all over the country and abroad participate to compete. This is followed by the amazing Night Market in the town. But the most attractive event at the festival is Naga chilly eating competition. Additionally, the pork eating festival which draws a lot of crowd evokes much fanfare and excitement. Learn about traditional arts, folk songs & games. Know more about tribal life exploring replicas of tribal huts, wooden carvings and drum instruments beats at end of the day. Binge on delightful gastronomy, the massive amount of food stalls along with rice beer to enjoy. Participate in Naga Chili eating competition recognized as the hottest event festival. The following travel tips will be handy if you are planning to attend the Hornbill Festiva. Another key point to note is that the festival begins from December 1, which is also celebrated as the Nagaland Formation Day. 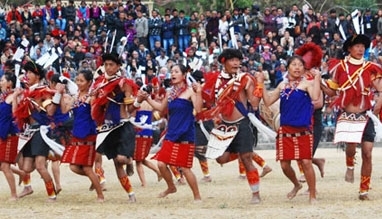 The festival is one of the top tourist attractions thus, draws a lot of tourists from in and around the Nagaland State. So, make sure to have your bookings well in advance to avoid any last minute hassles and inconvenience. There is an option of bargaining at various stalls and souvenir shops. So tourists can exercise this option to get the best deals. Foreigners are no longer required to possess the Entry Permit to visit Nagaland. However, they must register themselves with the Foreigner’s Registration Office (District Superintendent of Police) within 24 hours of their entry into the state. There is a very helpful Information Center located near the festival site. You can have the brochure which lists the festival events and other attractions in Nagaland from here. NH39 which is an interlink connecting Kohima to Meghalaya, Arunachal Pradesh, Tripura, Mizoram and Manipur. The state highways co-joins from Guwahati to Shillong where other states are accessed. Personal cabs and buses are available to reach Kohima. Kohima does not have a Railway Station of its own because of its tough hilly terrain. The closest rail link is in Dimapur, which is connected to the important towns of Guwahati and Kolkata. Although traveling by train can be a slow affair, it nevertheless is the best way to reach Kohima. Not only it is the cheapest but it leads through some of the most scenic views of the amazing mountain valleys and hills. Again Kohima does not have an airport of its own and the nearest airport is in Dimapur, at a distance of 74 kilometers. Dimapur operates only domestic flights and is connected to Kolkata and Guwahati from where there are direct flights. International travelers will first have to get off at either Kolkata or Delhi international airports and then catch a connecting flight to Dimapur. From Dimapur, it’s a two-hour cab ride to Kohima for which many taxi operators run to and fro which can be hired. However, the option of a 30-minute helicopter ride from the airport is also available in case you are in a hurry. 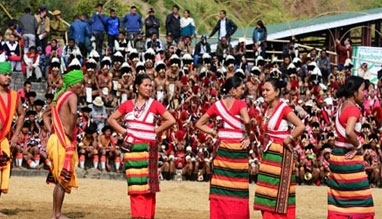 Attend the celebration of the diversity of tribes of Nagaland at the Hornbill Festival in Kohima. Before you attend the festival make bookings for your stay choosing from our collection of hotels in Kohima. Enjoy the natural blessings with a stay in hotels that are equipped with modern luxuries. If you want to explore more of the state and other delights of North East, you can browse through our collection of Nagaland tour packages. Also, check North East tour packages that include the visit to the other mountains states. Book comfortable and hassle-free travel plans to the unexplored North East with us. Partake in the Hornbill Festival in Kohima while soaking in the comforts of some of the best hotels. There are multiple luxurious hotels like Hotel Japfu, Hotel Vivor, Hotel Kohima and Razhu Pru.